Robert Shibukawa Jr. and his friends Cobie Cardinez and Makana ventured to one of their favorite spots and experienced an ulua blitz early in the evening. With six ulua already caught, Robert took a double strike. He landed the first one quickly, then turned his attention to his 13-foot Nitro pole. The 60-lb test line was being put to the test and his Newell 550 reel was screaming. Robert settled into the fight and eventually Cobie gaffed his monster fish... in the tail... and held on as the surge receded. The guys ran to Cobie's rescue and landed the 108.1-lb ulua. 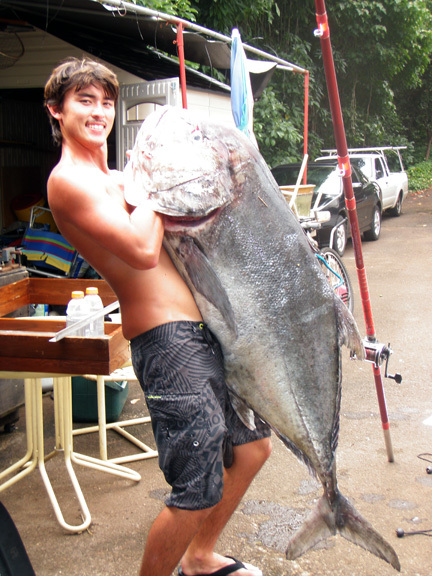 For 17-year-old Robert, this could be his first of many giant ulua.